When it comes to dishes made with coconut, I become hypocritical. I don’t care for a coconut cake, but I drool over a nice looking coconut cream pie. I am not a huge fan of the savory rice dishes cooked in coconut milk, but I love the rice dessert made with coconut milk. 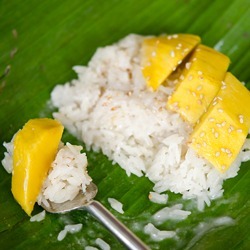 And this ever popular Thai snack/dessert called Mango Sticky Rice is one of my favorite coconut dish. Whenever I travel to Thailand I always look for a street vendor that sells this mouth watering, smooth, mildly sweet rice dessert with mango. Of course you don’t have to travel Thailand to get this lovely dish. It is easily found in many Thai restaurants these days. And even better, you can make it very easily at home. I will be honest. I wrote this post a while ago (about 1 year :)) and had left it in a draft file, then I had forgotten about it. The picture of this green mangoes reminded me of a my family trip to Kuala Terengganu, a lovely beach town on the northeast part of western peninsula of Malaysia. We stayed in a resort called Tanjong Jara. And there I got to know the resort chef. 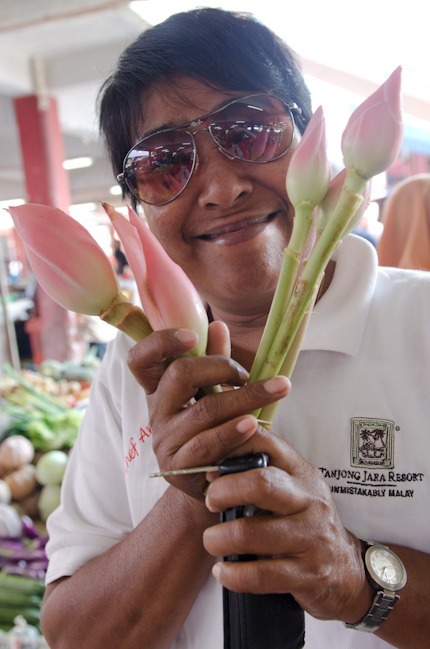 Her name was Anne; a lovely Malay lady who loves animals and food… Her sambal and fish curry were delicious! 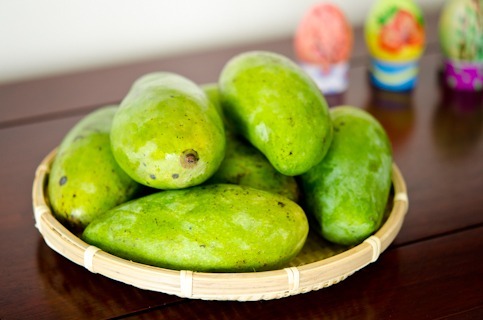 But with this green mangoes? Holy cow! these were the best mangoes I ever had in my entire life. So creamy and sweet… I bought a big bagful of them and brought home with me. For the next few days we ate nothing but these mangoes as a snack. And I made this lovely dessert with the last few mangoes remained. 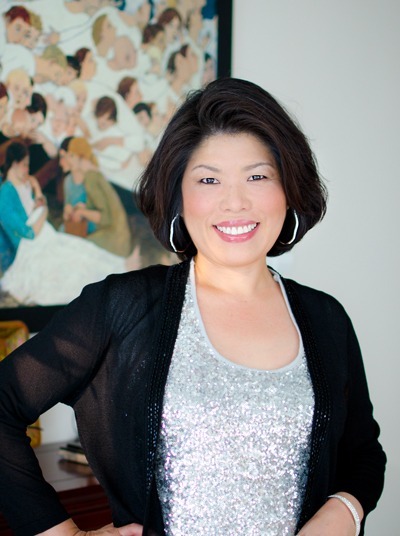 You have to use glutenous rice (sweet sticky rice) for this recipe. They are whiter and opaquer than the regular long grain rice. 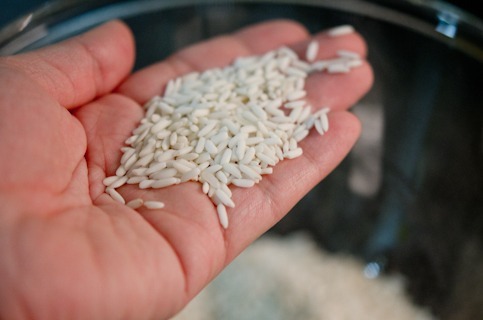 soak the rice in a cold water for at least 1 hour. Drain well. 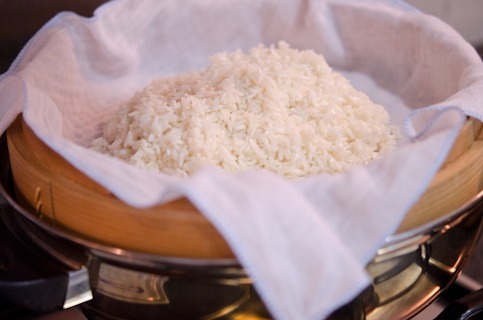 Place the rice in a hot steamer lined with a cotton towel. Make sure the basket is sitting over a few inches above the boiling water. Cover and steam for 20 minutes over medium-low heat or until the rice is tender. Meanwhile let’s make the sweet coconut milk. I used packaged coconut milk. 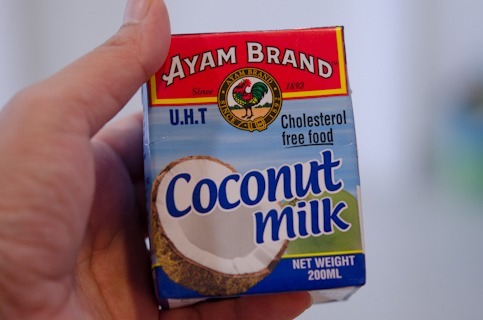 Canned or even a fresh coconut milk is great to use. When the rice is done, it will turn some what translucent and shiny. 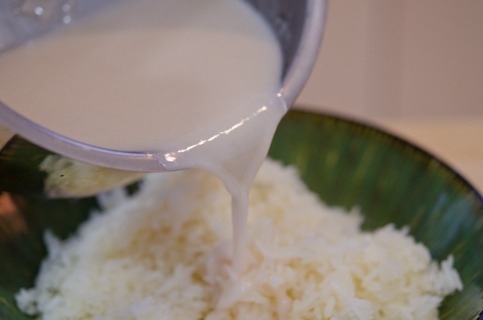 Transfer the rice into a bowl and pour about 2/3 of hot coconut milk mixture over and stir. 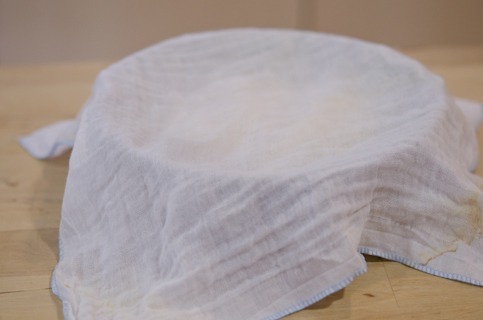 Cover with a cotton cloth. This will help the rice to soak up the flavor of coconut milk. Peel the mangoes. Ripe mango is quite slippery to peel. I found the boning knife works great for the job. Be very careful!!! 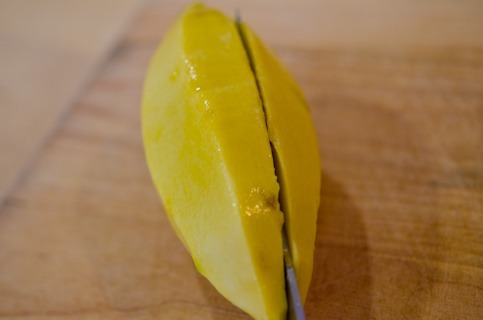 Peel the mango and slice down each side a little off the center to avoid the seeded area. Mango seed is flat and located in the center. If your knife is heating the seed, move the knife a little to the side and slice down. Lay each side of mango flesh and slice into big chunks. Make sure your mangoes are fully ripen. 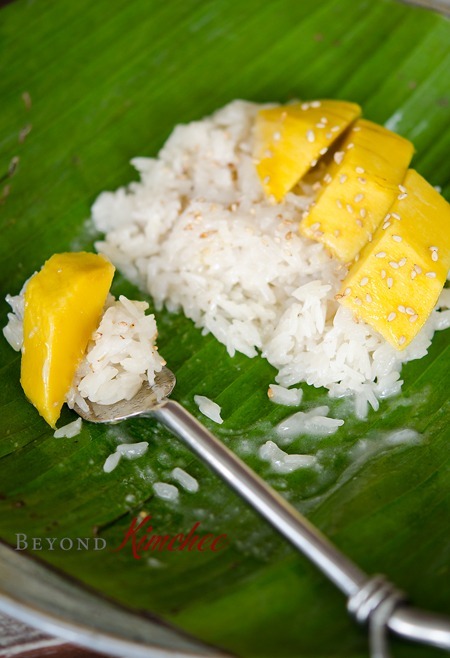 Place these mangoes over or on the side of the coconut rice. Drizzle the remaining coconut milk over and sprinkle a little toasted sesame seeds, if using. 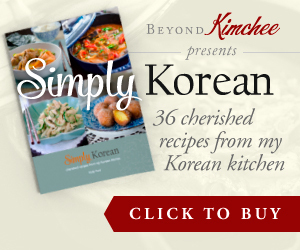 This is a great way to end Asian meals or enjoy as a satisfying snack or breakfast. 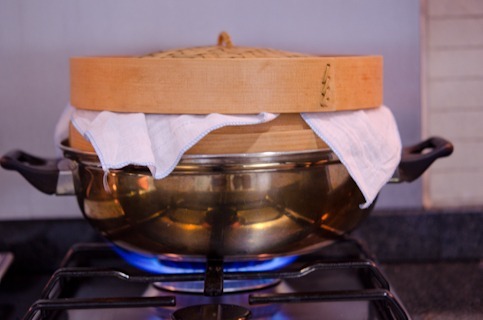 Drain the rice to removed the water and place in a hot steamer basket lined with cotton cloth. Make sure the basket is sitting over a few inches of boiling water. 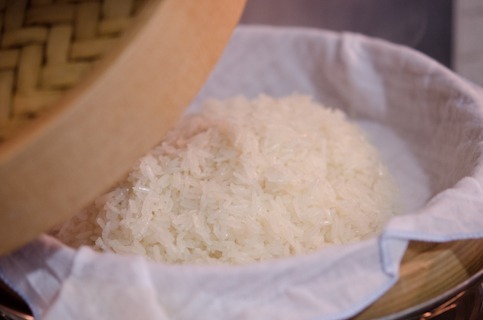 Steam the sticky rice for 25 minutes until the rice looks shiny, translucent, and soft and chewy to the texture. 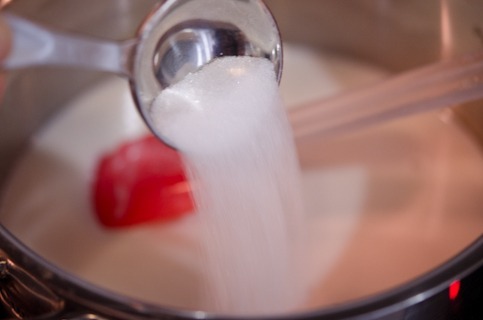 Meanwhile heat the coconut milk with sugar and salt in a pot until hot and the sugar dissolves. When the rice is done, transfer to a large bowl and pour about 2/3 of hot coconut milk over the rice and stir. 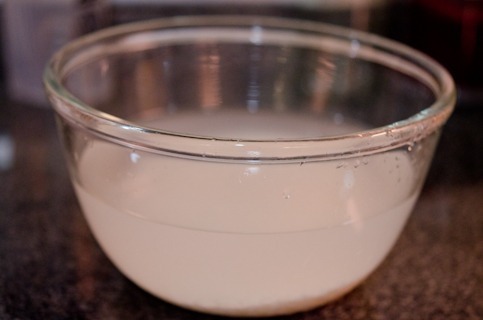 Cover the rice with cotton cloth and let it sit to soak up the milk for 20 minutes or longer. Peel mangoes and slice each side off the seeded are in the center. 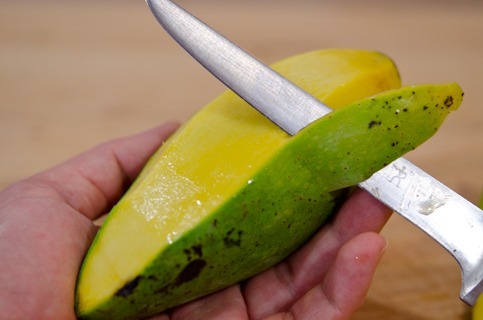 Mango seeds are flat and if your knife is hitting the seed, move the knife a little off from the seed and slice down. 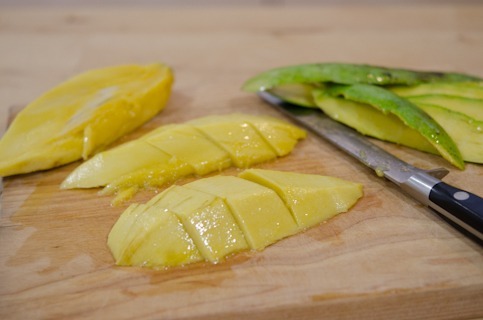 Lay the mango slice flat and cut into big chunks. 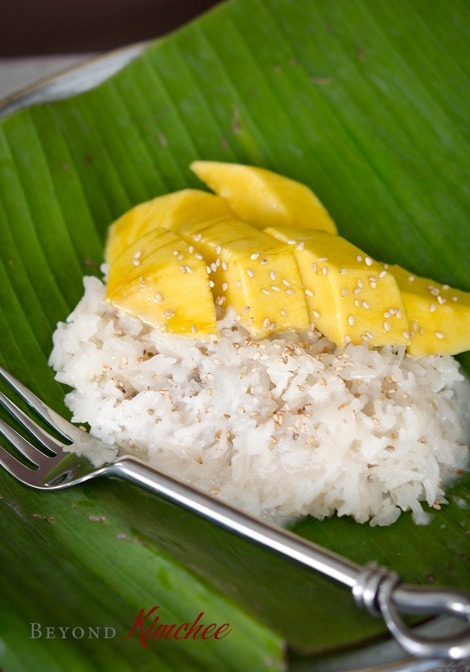 To serve, place a mound of rice on a plate and lay a few slices of mango on the top of the rice or on the side. Drizzle the remaining coconut milk over and sprinkle with a little bit of sesame seeds, if using. It's interesting, I love coconut too, but I'm usually not a fan of savory dishes made with coconut milk. Weird. Anyway, this mango sticky rice looks wonderful! I love anything with mango, and this look terrific - thanks so much. Hi Holly, I can't wait to try your recipe. Our family just loved mango sticky rice. Thank you for the post! Una verdadera delicia que ganas de probar un postre fabuloso,abrazos.